Help Us Write the Biography of a NHL Season in Trading Cards and Win! In four of the last five seasons, Upper Deck has created a special set of trading cards available exclusively from our Certified Diamond Dealers that celebrates the NHL season. Most trading card sets are planned out so far in advance, manufacturers cannot share recent happenings through trading cards. Upper Deck’s “Biography of a Season” set is a limited release and with a small print run we can turn the production of these cards around much quicker. The design for the first year of Upper Deck's Biography of a Season set was not very elaborate. It has definitely been enhanced and evolved through the years. Three times during the season we will record some of the latest events or player achievements and deliver them quickly to fans through our authorized hobby shops taking part in the program in the United States and Canada. 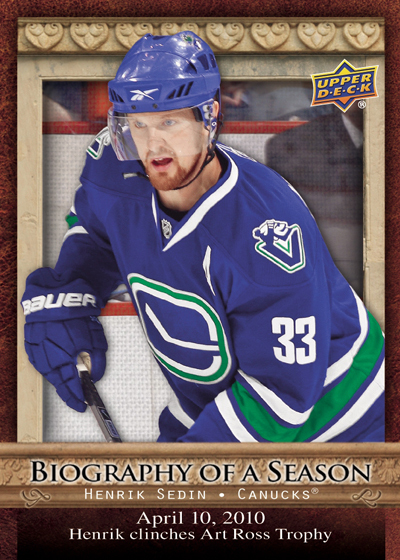 By just purchasing a few packs of new Upper Deck cards each week, you can get a new “Biography of a Season” trading card. While the “Biography of a Season” set will be returning for 2011-12, we wanted to put a new twist on it. In the past our hockey team has selected which players or events will be selected to be a part of the 30 card set that chronicles all the key moments of the season. We are currently working on the checklist for the first ten cards for the 2011-12 NHL series, but we want to let our fans put their stamp on this set. We will be going out to our fans each time we produce the checklist and take your feedback on which moment you would like to see Upper Deck capture for the set. This initial group of ten cards will capture moments that took place from the 10-11 NHL Playoffs, the 2011 NHL Award winners, the 2011 NHL Draft, noteworthy off-season trades and other key events or news leading up to the start of the season. So much has happened in the NHL during that time, but we are looking to our fans to help us develop the most compelling content. Which moments would make the best trading cards? Help us write the biography of a NHL season through trading cards and you could win. Just share at least three moments you think we should capture in the new “Biography of a Season” set in the comment section and we will randomly select three fans to receive a special NHL trading card prize. Make sure to include your email address when you submit your comment. Winners will be selected and notified on Monday, September 19, 2011. 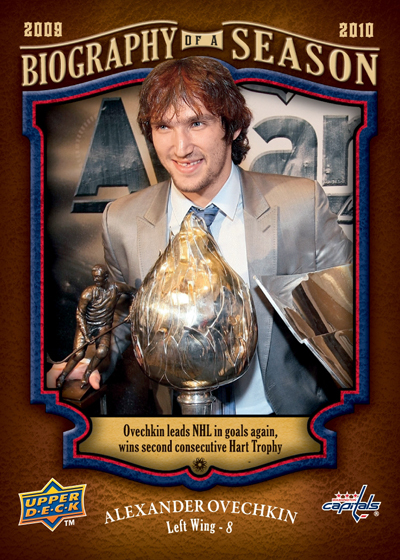 You will have the opportunity to pick up your 2011-12 Upper Deck NHL Biography of a Season cards in stores this November. To help inspire you, take a look at some of the designs from previous seasons. We will reveal the design for the 2011-12 set along with the checklist in the coming weeks! The 2008-09 NHL Biography of a Season set started off by capturing this great Stanley Cup moment. Award winners are also provide great content for this first series of cards. 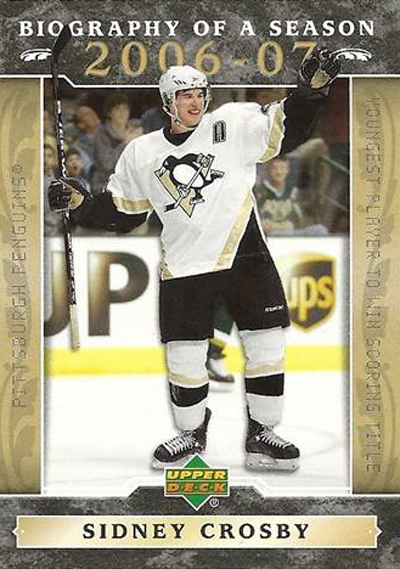 Help us write the 2011-12 NHL Biography of a Season by sharing the moments you would like to see on trading cards in the comments section below! 3. A special tribute card for all the NHLers and former NHLers that passed away this offseason. Obviously there are moments like the Stanley Cup, and the 1st overall pick that are obvious inclusions but I think that #3 would be a very nice touch if it was included. I suggested this one on Twitter a couple weeks ago and will do it again here – Carey Price Records 100th Career Win! In addition to that one, here are some others…. 1. Carey Price Records 100th Career Win! 1. I would do a sophomore set with memorable first goals, cause there was really amazing goals. 2. All the award winners. 3. Goalie saves, they dont get much attention anymore. Tonelli to Nystrom. Islanders Win The Stanley Cup! Biography of a post-season, one card for each series in the playoffs, on the back of the cards are the scores from each of the games in the series. 1. Remembrance of the NHL players who passed away over the summer months. I wouldn’t focus on the why, but rather celebrate their incredible careers. 2. Chris Drury retiring. He’s won the Calder Trophy & the Stanley Cup. Again I would celebrate his remarkable career. 3. Brendan Shanahan becomes NHL’s VP of Hockey & Business Development. Shanahan was a fan favorite and is both interesting and exciting to see him continue his career within the NHL organization. These three choices highlight what the lives of players on and off the ice. The off season is a holistic time where players become better known for aspects other than their statistics. I also feel that these three would be a departure from highlighting achievements in statistics and add depth to the Biography of a Season card set. #1 Rick Rypien,#2 Derek Boogaard,#3 Tom Cavanagh,and if you can make a checklist dedicated to those lost in the terrible plane crash. 7- Mark Schiefele becomes the first pick of the new Jets. 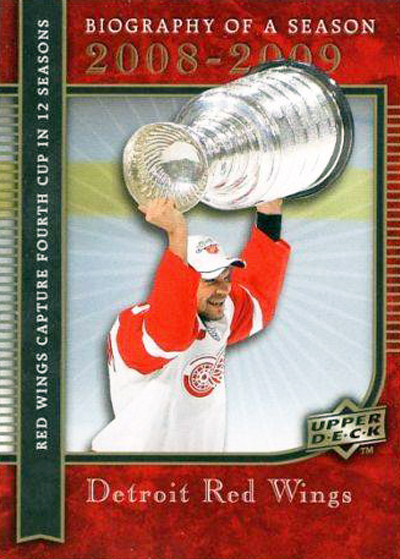 I think that in memoriam cards of Demitra , Rachunek , Liv , McCrimmon , Karpotsev , Salei , Vasicek , Skrastins ,Vasyunov and Korolev should be put in 2011-12 Upper Deck Serie 1.
the return of the jets an obvious one. how about the russian plane disaster card remembering fallen heroes. 1. Alex Pietrangelo scoring from centre ice against the LA Kings. 2. Ryan-Nugent Hopkins being selected as the first overall pick in the draft. 3. Tim Thomas fulfilling his Cinderella story by winning the Stanley Cup and the Conne Smythe trophy. Thanks for the contest UD! The Boston Bruins win the Stanley Cup when they beat the Vancouver Canucks 4-0 in the seventh and deciding game of the National Hockey League championship ending their 39 year Cupless drought. The Edmonton Oilers continue their rebuilding process and for the second consecutive year hold the number one draft spot at the 2011 NHL Entry Draft, selecting Ryan Nugent-Hopkins from the Red Deer Rebels of the WHL. Jaromir Jagr, seeking a return to the NHL after three seasons in Russia’s KHL finally ends all speculations on where he would continue his career on July 1, 2011 by signing a one-year deal with the Philadelphia Flyers. 1. Boston winning the cup. 2. All of the NHL players that passed away. 3. When the stanley cup fell in Michael Ryders home Province. I think these would be good for the set. 1. Ol’ Reliable – Jarome Iginla nets 30 goals for the 10th straight season. 2. Grandpa Duck – 40-year-old Teemu Selanne finishes 8th in league scoring with 80 points. 3. First Impression – Jordan Eberle wows the crowd with a highlight reel goal in his first game with the Oilers. 1. Nathan Horton waving a towel over his head to rev ip the crowd after being inured in the finals. 2. Tim Thomas wins Conn Smythe. 3. Winnipeg reveals team name at the entry draft. Those are my thoughts…I think the image of Horton waving the towel and the look on his face would make for a pretty sweet card. 2. Bostons surprising run for the cup and a couple focus around Tim Thomas who was beyond brilliant. 2. Lidstrom picks up 7th Norris Trophy in 10 years. 3. Ryan Nugent Hopkins drafted first overall. All big moments in the league. 2. Do a tribute card with the team picture of Lokomotiv or feature any of those players from Lokomotiv. Probably the worst hockey tragedy that has happened to date. 9. Jagr’s Philly debut. The minute he steps on the ice he becomes the NHL’s active scoring leader as well. 10. Flyers 11-12 Stanley Cup win….may as well get the printer started now. Locomotiv Memorial. I think since then, there’s been no rivalry gibberish of NHL vs KHL and hopefully it will leave a lasting reminder that we all love hockey and that pretty much makes us the same. Concussion/Depression Awareness. Let’s address the enforcer deaths head on. Beating around the bush is what leads these poor souls to anguish on their own. Maybe interview some enforcers and see what they have to say- could be quite compelling. Here are my favourite moments so far! 1) A tribute to all who have passed away this summer. 2)Return of the Winnipeg Jets Franchise! 3. Carter and Richards traded from Philly. 4. Jagr rejoins NHL with Philly. 5. Atlanta moves, Jets are back! 1. Jeff Skinner has great season for the Canes taking the Rookie of the Year. 2. Someone has to have a high res photo of Tim Thomas making that diving stick save for his performance in the playoffs. I think this hockey set should have cards featuring a picture of the frontside of a retired jersey on the front of the card and the backside of the retired jersey on the back of the card. If possible they could come with game used or auto variations. Forsberg number goes to the rafters. – 2 time Stanley Cup Champion. Tim Thomas year. Bruins win Cup. 1. Iginla scores 30 goals in 10 straight seasons and 1000th point. 2. Rookie Seguin wins the Cup. 4. Canucks green men make an impression. Modano signing a one day contract to retire as a Star. The return of the Jets franchise. I suggest Big Joe Thornton’s 1000th game among his other records he will accomplish this season. Great goods from you, man. I’ve be aware your stuff prior to and you’re simply extremely fantastic. I really like what you’ve bought right here, really like what you are stating and the way in which you are saying it. You make it entertaining and you continue to take care of to keep it sensible. I can not wait to read far more from you. That is really a great web site.